Serve this refreshing drink as an apéritif for your guests. Freeze the mint and lime zest with cold water in an ice cube tray. In a large jug, mix the lime juice with the apple juice, sparkling water and elderflower cordial. 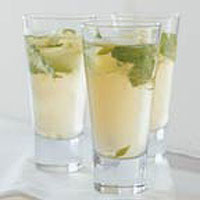 Stir and serve in tall glasses with the mint and lime ice cubes. Decorate with fresh mint sprigs.